After hearing about Apple Pay the other day, as a developer who implements payment services through software, I was curious about what it might could offer myself and my clients. Here are some questions I had and what I found about about them. Two groups: the consumer and the business. The consumer, anyone who has and iPhone 6 or Apple Watch. I originally envisioned Buy buttons on websites, but it's only for people who have iPhone6 or the Apple Watch. Businesses who have retail or mobile apps. If a business has a retail store that already accepts credit cards with the scan and go technology, then they'll likely be able to accept Apple Pay. Or, if you're a business with a mobile iOS app, then you can use Apple Pay to accept payment for any purchases within the app. On the consumer side, you store credit cards in your passport. When you're ready to checkout, you choose a card and hit pay. On the business retail side, Apple makes use of NFC-enabled credit card readers. Apparently Google Wallet already does this. On the mobile app side, developers will likely still go through an existing payment processor like Stripe or Authorize.net. Apple won't store any of the credit card numbers, but will work with the payment processors to store tokens and will randomly update them. This is similar to how Stripe works now with web applications. We send the credit card number to Stripe, then Stripe sends the appliction back a token, and then the application can use the token to make purchases in the future. When does it get started? 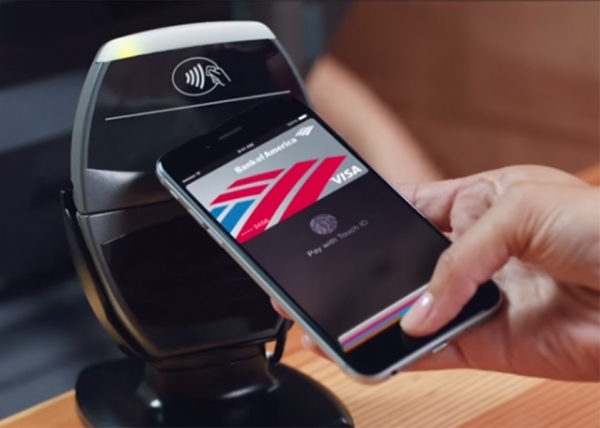 It appears Apple Pay will get started in October. Apple has been working behind the scenes to preapre the payment processors, build partnerships with banks and get retail (220k) stores on board. My kids, especially my 7 year old, have recently gotten into video games. It's a struggle to regulate the appropriate amount of time he should or shouldn't be spending. My wife and I are still trying to formulate a plan we think is reasonable and good for him. But that's a different story. What I wanted to share is something I found really cool. One of the video games is called Farm Simulator. As you might guess, it puts the player in the role of a farm owner. You have to manage money, planting, harvest, workers, equipment, etc. It's actually a pretty cool game and teaches some basic business skills in addition to the entertainment. Well, along with "playing" the video games, he likes to look up videos of other people playing the games on YouTube. People who can record their screen will record the game and narrate what they're doing. My son first starting doing this the first of this summer while we were on vacation. We didn't bring any games, but did have the iPad, so he would watch the videos during free time. What was cool was he started seeing all of the cool tricks and things he wanted to try when he got back. But, he was afraid he wouldn't remember them. This was a perfect opportunity to introduce the pocket journal I had brought for him. I'm a big fan of writing and wanted start sharing the benefits of it with him. So he starts jotting down notes and before the trip is over, he can't wait to get back and try all of the cool tricks he had written down. One interesting trick he found was how to hack the bank account for his farm and increase the money to whatever he wanted, which would allow him to buy whatever expensive tractor or equipment he wanted to try out. We had to actually help him with the details, but he found it and knew how to use it...I was pretty impressed. I have a few takeaways from this experience. How amazing the internet is. I've said before, I've gotten an additional degree free from the internet. I now make a living programming software 100% learned from teaching myself online. How cool is it that others are willing to share what they learn. What can I be sharing today to help others? How will the internet change education in the future? Will traditional education adopt more self taught, hands on learning methods. We don't all learn the same way, but we're almost all taught the same way in early education. There's something really cool about having a fascination and enthusiasm about something and a desire to learn it, and then given the opportunity and means to figure it out. That's one thing I love about my job. I'm essentially given that opportunity on a daily basis. Sometimes I may bang my head against the desk trying to figure out a problem, but eventually the satisfaction and reward of hard work pay off. I've been cycling more than usual recently. I'm not sure why really, just wanting to stay in shape and keep the weight off. I noticed something the other day while riding. It's not the first time I've noticed it, but it doesn't happen often. Sometimes you're pedaling along and enjoying the scenery, maybe daydreaming, and your thoughts turn to your pace. When you're riding by yourself, you know what kind of effort you want to target. You know the pressure and power you want to apply to the pedals. Most cyclists can consistently apply the same amount of power for long periods of time. Occasionally, when you're riding along, and even though you feel you're at the limit of the effort you want, you'll shift into a harder gear. Sometimes it may be by mistake, and sometimes just to change rhythm. On rare occasion, you'll find that gear easier, or at least no harder. Surprised, you'll shift again, into an even harder gear. Sometimes, event a third or 4th time you'll shift and keeping the same cadence, you'll be going much faster with seemingly no additional effort. It's an amazing feeling because here you are riding along at what you think is your ideal pace, then you shift gears and are able to travel faster without trying much harder. Well, as this happened to me the other day, I got to thinking about this and how it mirrors life in some degree. Don't we all get bogged down in a pace that we think is our best. Whether it's a career, relationship, skill, etc, sometimes we're just cruising along daydreaming, enjoying the scenery. I wouldn't say that is necessary always bad thing, but if you think that you're going full speed but are not, then what could happen? In your career, you may start to become invaluable or get passed by someone else or your marriage or other relationship could become stale. I like this idea of shifting gears, changing things up. Learn something new, take a different position, go on a trip, or whatever it takes to refocus. For me, getting comfortable isn't a place I want to go yet. 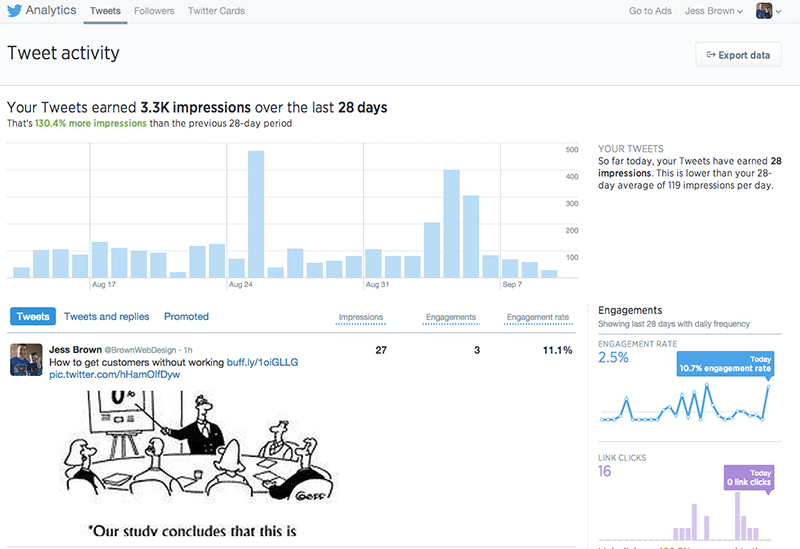 Have you seen the new twitter analytics? I've been a twitter user since about 2009. I've done a lot of consumption and responding to others, but my attempts at building much of a following haven't been very successful. I admit, I haven't tried very hard. Sometimes I go through spells where I'm devoted to sharing and reporting things, but other times I'll go months without tweeting or even opening twitter. When I do tweet, I usually use Buffer to send out tweets and to post to other platforms like Facebook, Google+ and LinkedIn. Buffer also offers some analytics. My typical tweet would go out to my 350 or so followers, and I'd occasionally get maybe 1 fav, one clicked link, or one @mention. If I had to guess I'd say I'd get 1 of those around every 3 tweets. Needless to say, I've always been disappointed with this amount of interest in things I've found interesting. What was wrong with people anyway? Well, I guess you could say the competition is tough. You're competing with the voice of millions...and not just mere normal folk like me. There's presidents of countries, rock stars, amazing athletes, brilliant scientists, successful entrepreneurs, and of course, the Ashton Kutcher's and Kardashian's of the world. So back to analytics. I'm not sure when they released it, but I think it was fairly recent. It was neat to see new insight into the readership (or lack thereof) of my tweets. The first think I looked at was impressions. This is a number that buffer doesn't give me. My big surprise was the low number of impressions that I got. Out of 350 followers, I'd say I receive an average of about 50-60 impressions, which is about 16%. On one hand I'm a little relieved that would help explain a lack of interaction. But, on the other hand, it'd a little disappointing that only 16% of my tweets are even showing on people's feeds. I assume that probably half or less of those are even read given the skim nature of reading a feed. So that is interesting, but how to increase it? Maybe tweeting different times of the day, maybe tweeting the same tweet more than once? Could it be that people use lists and though they follow me, I'm not on a list that they read the majority of the time? Another interesting thing. I got a retweet (don't get much of those :) about my 30 day blogging challenge. It was by a user who has about 3700 followers. My impression count for that went to 275. If you take away my average of about 55, that's an impression rate of 6%. That's a good bit lower than my 16%, but that makes sense to me, I'd expect retweets to get a lower number of impressions. Engagements are the total number of times a user has interacted with a tweet. This includes all clicks anywhere on a tweet (including hashtags, links, avatar, username and tweet expansion) retweets, replies, follows and favorites. This also gives you additional information than buffer could. So if a user does anything with a tweet besides read it, it shows up here. My engagement rate isn't too bad considering my impressions. I mixed in my feelings. I'm a little more understanding of the lack of engagement, but still struggle with how to interact more and build more of a substantial following. At least, I guess that is a goal. If you want to market yourself and be in the mix for business, you need supporters, buyers, friends, etc. What do you think? How do your numbers compare to mine? Let's say you're an electrician and you run a small electrical contracting company. There may be 1000's of other companies that offer the same services, at the same prices, in the same turn around time, with the same friendly smile as you do. The only difference? Only a few are geographically close enough to the customer to do the job. A lot of small business benefit from a geographic advantage but most technology companies (large or small) don't enjoy this benefit. Take my consulting company Brown Web Design, for example. A local entrepreneur could just as easily hire someone in Ohio as they could me to develop software for their business. There's no real advantage to being close. Another example: A business could just as easily use software built and maintained in Australia as they could from people in their home state. There are a few advantages, time zone and language. Time zone is not that hard to work around, especially with people's acceptance of asynchronous communication these days. Language is another topic. So the questions is, if you own a small company, how do you compete? How do you market and network? How do you gain an advantage? Well, first there are some geographic advantages to marketing and networking. A developer in Ohio isn't likely to come to Atlanta to attend the monthly Ruby meetup or Web Design group. So being visible at local gatherings is a big benefit. Speaking at these gatherings is even better. Another idea I've been trying to wrap my head around (because I'm not very good at it, but I see others doing it well) is the concept of virtual communities. With the loss of some geographical advantage, there's opportunity to be heard and seen in virtual communities. What are some of those? They can be technology specific ("The Ruby Community"), or business topic specific (the startup community, enterprise, SMB's, etc) industry specific (accounting, manufacturing, real estate). I not a google plus fan, but I like their term of circles. If you're socially active, you have circles of friends and influence. You might have an audience of social followers, blog readers, or email subscribers. They're all potential areas of opportunity. I'm not pointing out anything new. The crazy growth of marketing tools to help companies reach these virtual communities like Pardot, Google Adwords, Mailchimp, Hubspot reveal that others are doing online marketing with amazing success. So what's my point? If I have one I guess I'd be this: Embrace the competition and take advantage of opportunities provided online.